Disgusting Things Youd Rather Not Know By Daniel Zalewski Learning Turn Inc. All rights reserved From the book: You wouldnt want to be an Egyptian Mummy! 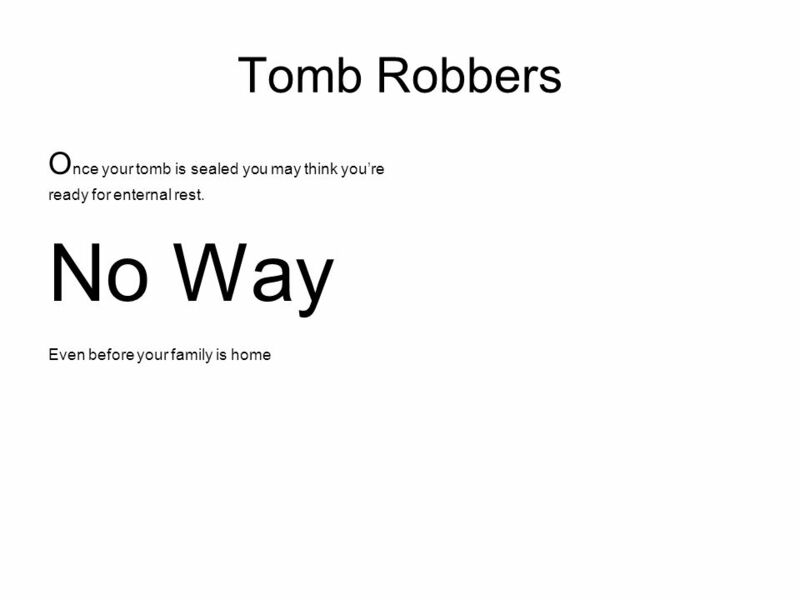 Your body would be embalmed and mummified. 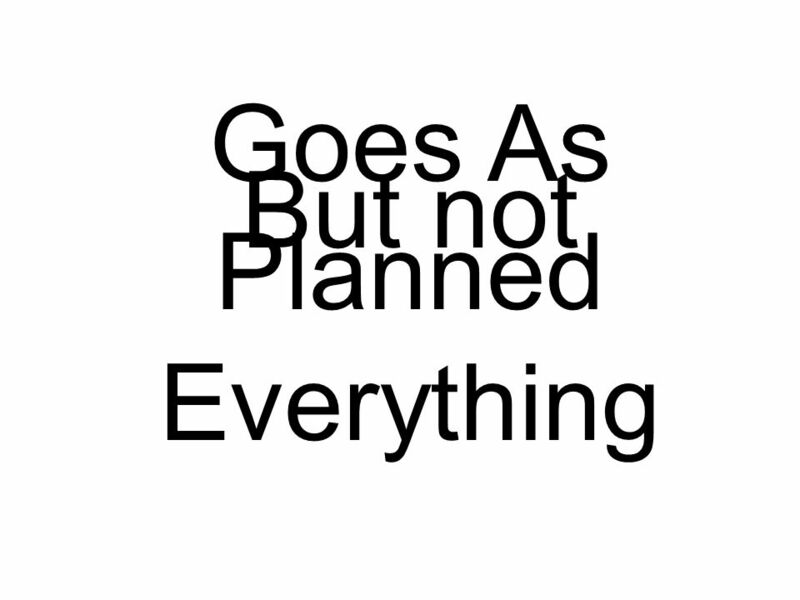 Everyone who could afford it would make elaborate preparations for this. This was believed to preserve the body allowing the spirits to survive. What could you afford?? 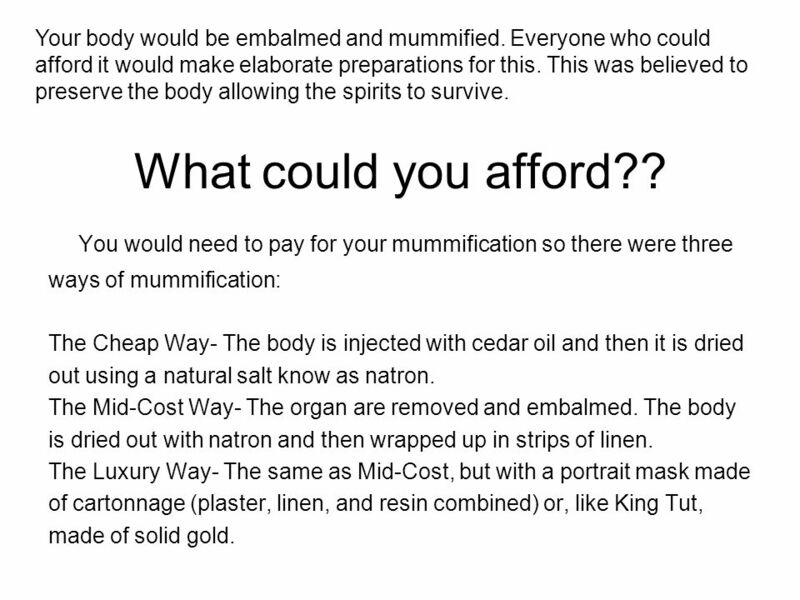 You would need to pay for your mummification so there were three ways of mummification: The Cheap Way- The body is injected with cedar oil and then it is dried out using a natural salt know as natron. The Mid-Cost Way- The organ are removed and embalmed. 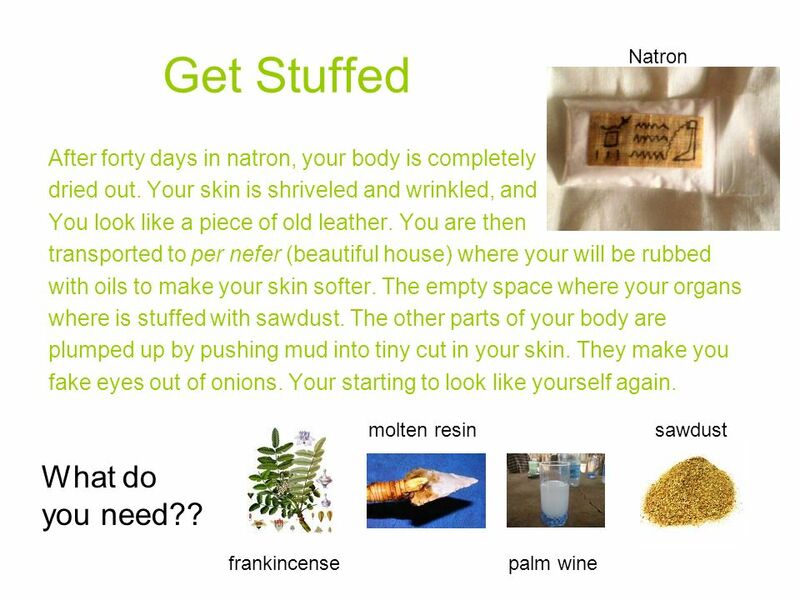 The body is dried out with natron and then wrapped up in strips of linen. The Luxury Way- The same as Mid-Cost, but with a portrait mask made of cartonnage (plaster, linen, and resin combined) or, like King Tut, made of solid gold. although your heart is left in your body you will need this later. Once the body cavity has been stuffed, the cut along your left side is sewn up and covered with the carving of the eye of the sun god, Horus. 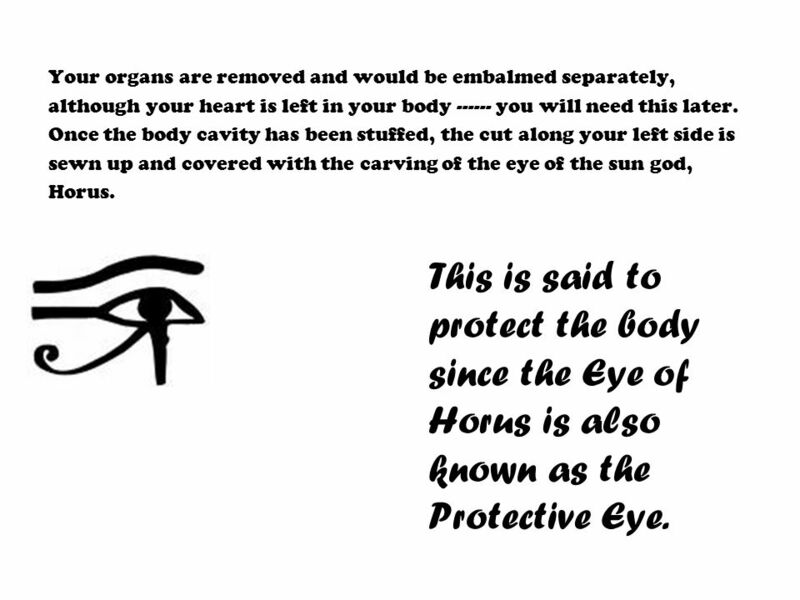 This is said to protect the body since the Eye of Horus is also known as the Protective Eye. 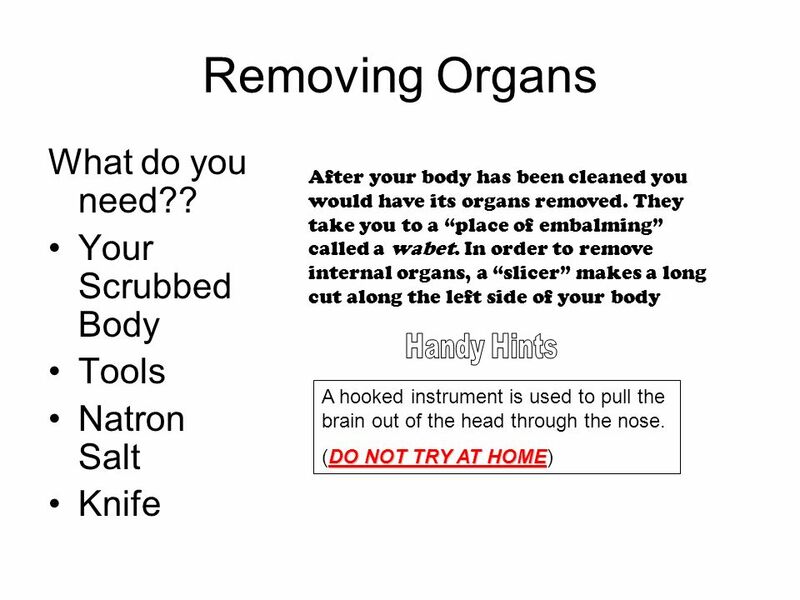 6 Storing your Organs YOUR LIVER will be stored in a jar with the human head of the god Imsety on it. 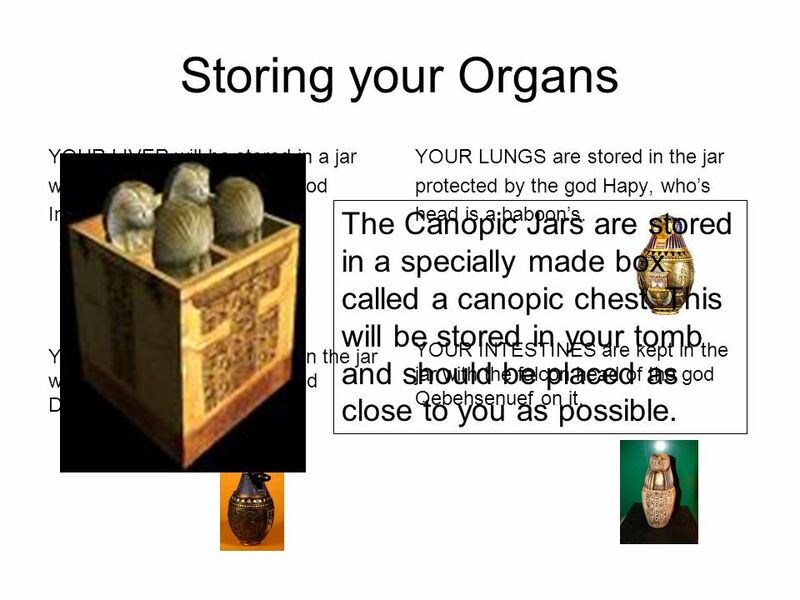 YOUR LUNGS are stored in the jar protected by the god Hapy, who’s head is a baboon’s. The Canopic Jars are stored in a specially made box called a canopic chest. 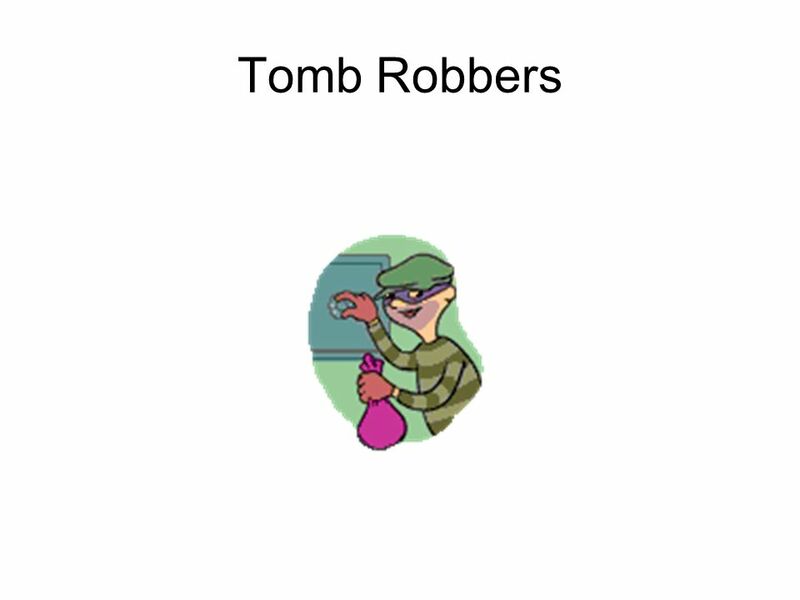 This will be stored in your tomb and should be placed as close to you as possible. YOUR INTESTINES are kept in the jar with the falcon head of the god Qebehsenuef on it. YOUR STOMACH is placed in the jar with the jackal head of the god Duamutef on it. 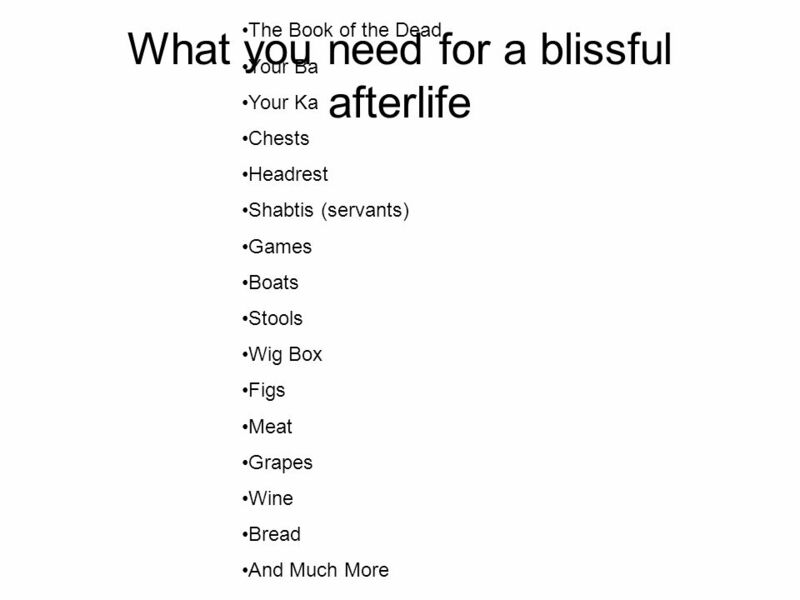 7 Get Stuffed What do you need?? 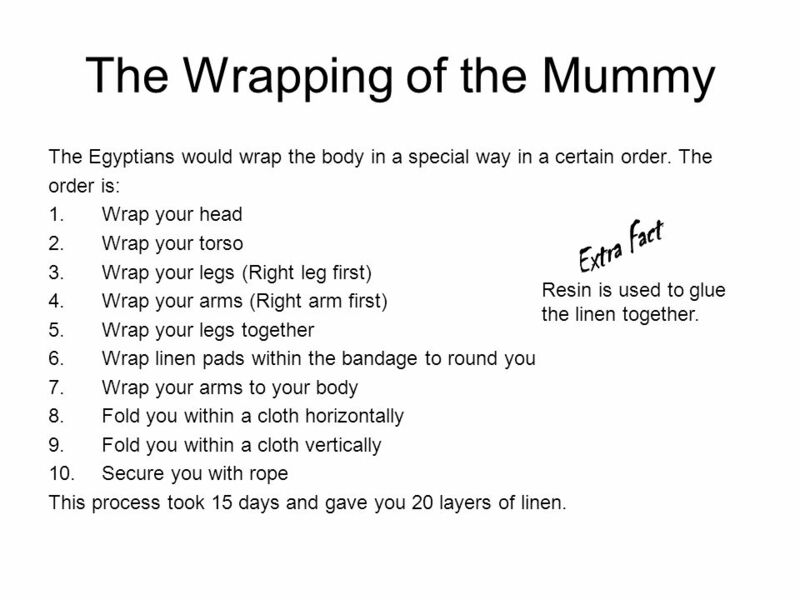 The Egyptians would wrap the body in a special way in a certain order. The order is: Wrap your head Wrap your torso Wrap your legs (Right leg first) Wrap your arms (Right arm first) Wrap your legs together Wrap linen pads within the bandage to round you Wrap your arms to your body Fold you within a cloth horizontally Fold you within a cloth vertically Secure you with rope This process took 15 days and gave you 20 layers of linen. Extra Fact Resin is used to glue the linen together. 9 Bury all the equipment used to !!! !mummify your body!!!! 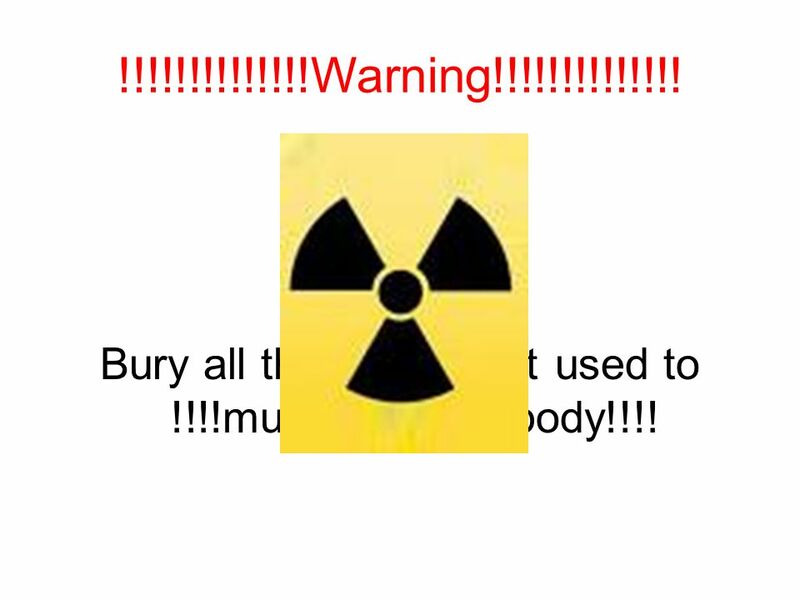 !!!!!!!!!!!!!!Warning!!!!!!!!!!!!!! You must Must Bury all the equipment used to !!! !mummify your body!!!! Once you have been wrapped, you will need a good wooden coffin. If you are very wealthy, you could have as many as three coffins all fitting inside one another. Make sure they have pictures of the gods and all the correct spells painted on them to protect you. Of course, they should also have plenty of hieroglyphs singing your praises written on them. This nest of coffins will finally be placed in your tomb inside a large stone coffin called a sarcophagus. 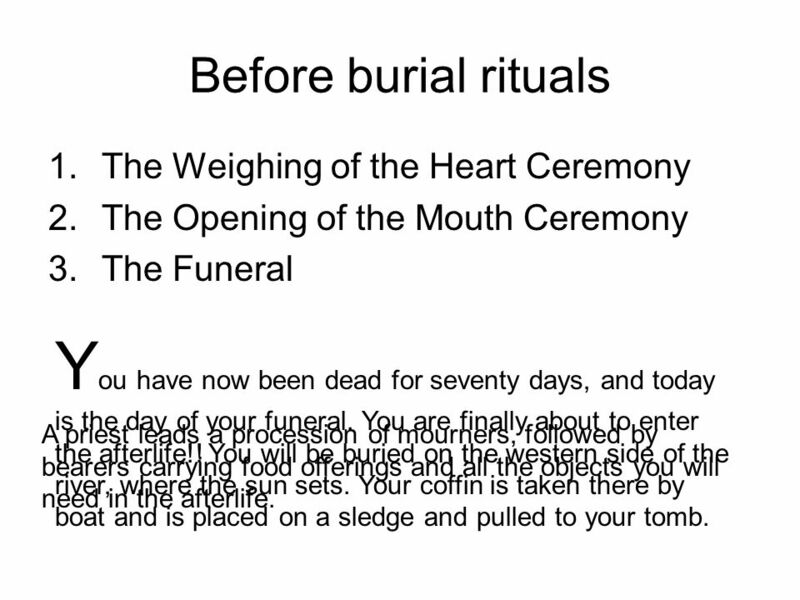 12 Before burial rituals The Weighing of the Heart Ceremony The Opening of the Mouth Ceremony The Funeral You have now been dead for seventy days, and today is the day of your funeral. You are finally about to enter the afterlife!! You will be buried on the western side of the river, where the sun sets. Your coffin is taken there by boat and is placed on a sledge and pulled to your tomb. A priest leads a procession of mourners, followed by bearers carrying food offerings and all the objects you will need in the afterlife. 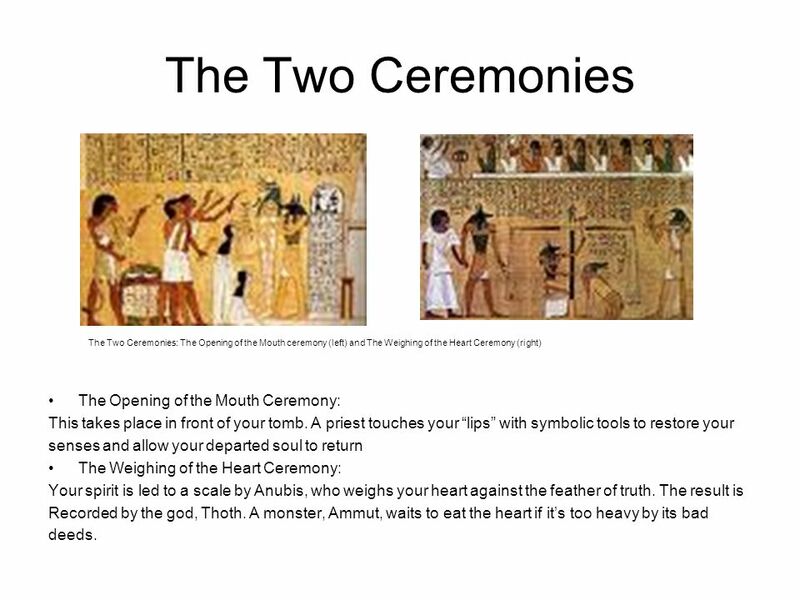 The Two Ceremonies: The Opening of the Mouth ceremony (left) and The Weighing of the Heart Ceremony (right) The Opening of the Mouth Ceremony: This takes place in front of your tomb. 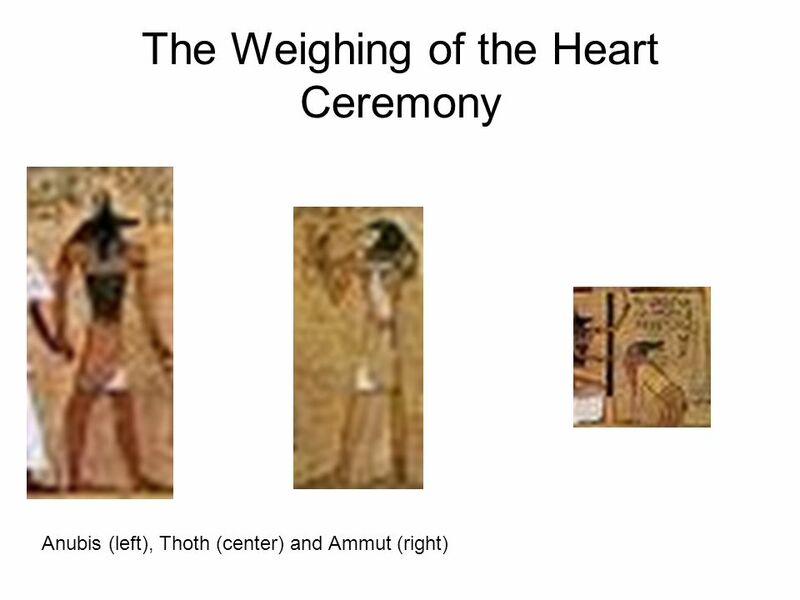 A priest touches your “lips” with symbolic tools to restore your senses and allow your departed soul to return The Weighing of the Heart Ceremony: Your spirit is led to a scale by Anubis, who weighs your heart against the feather of truth. The result is Recorded by the god, Thoth. A monster, Ammut, waits to eat the heart if it’s too heavy by its bad deeds. 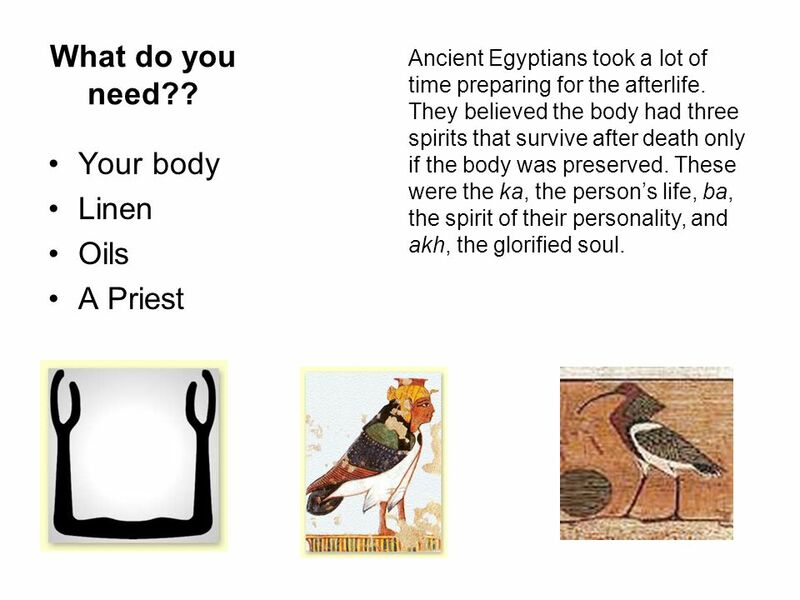 Download ppt "If you were going to be an Egyptian Mummy"
You wouldn’t want to be an Egyptian mummy! Mummification Preparation for the Afterlife Early Burial Practices Dead Buried in small, shallow pits in the desert Bodies dehydrated very quickly Created. Mummification & Afterlife. Mummification Ancient Egyptians mummified the bodies of their dead royalty. It was very important to their religious beliefs. The Mummification Process. The first mummies were just dried out in the desert. The ancient Egyptians buried their dead in small pits in the desert. Egyptian Mummification. 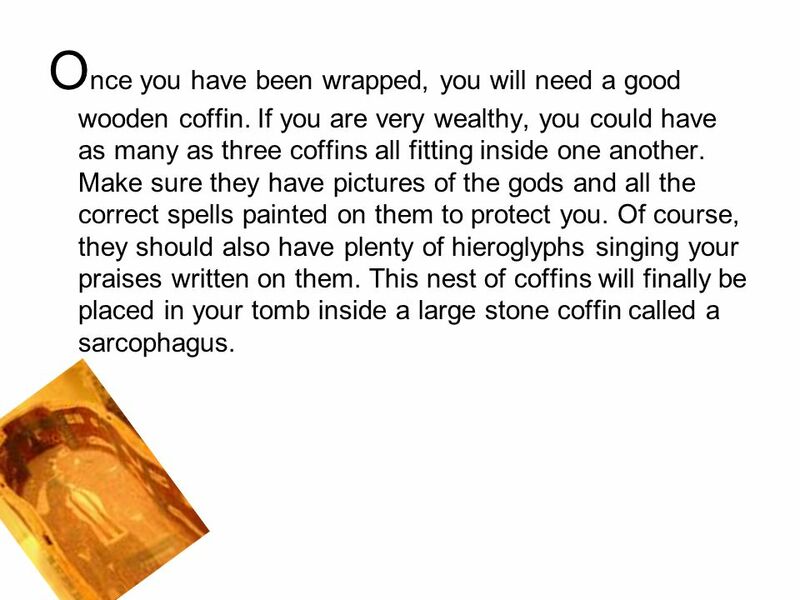 How to Mummify a Body in Ancient Egypt Things You’ll Need: Body Canopic Jars Linens Cloth Coffin Salt Resin. EGYPTIAN MUMMIFICATION. 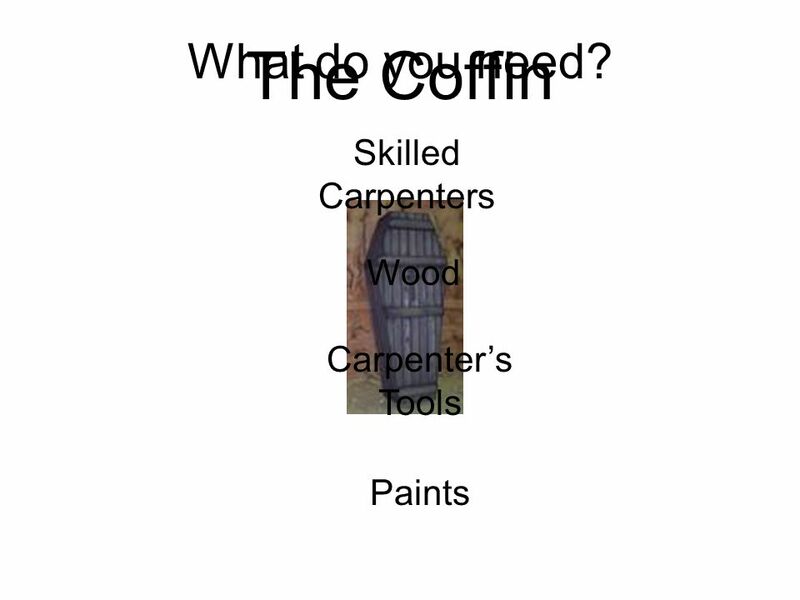 Do Now  Take out your Lesson 4.2 Fact-Finders and let’s discuss the following: 1. Why did Egyptians preserve the bodies of the. EGYPT - Religion Gods and Godesses, Book of Dead, Spirit of Dead, Mummification, and the Afterlife. The mummification process begins with a ceremony conducted by four priests with one of the priests dressed as the jackal-headed god, Anubis. This takes. MUMMIFICATION. INTORODUCTION  Mummification is the preservation of a body, either animal or human.  During the prehistoric period (4650-3050 BCE) the.